Earlier topic: Arab press serial number ID? I just acquired a smallish proof press that I am very excited to use and learn more about. 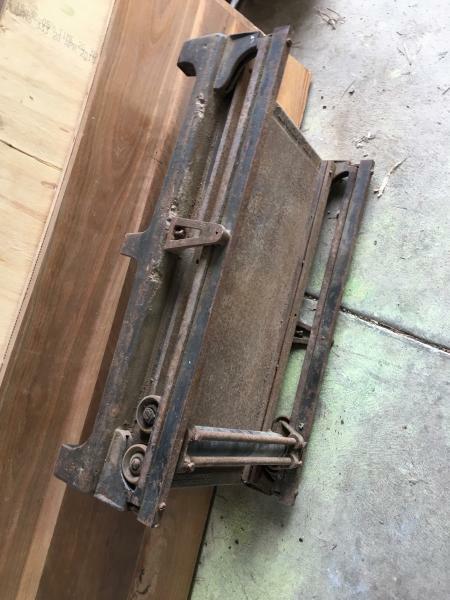 I have asked the internet with little luck and so thought I would ask hear if anyone knew anything about this press and or its history. 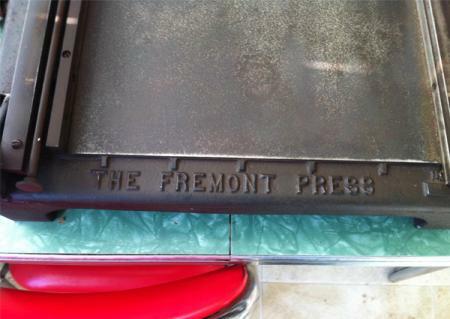 I can’t find a serial number on it but it says “The Fremont Press” I have photoed the other text on the body. 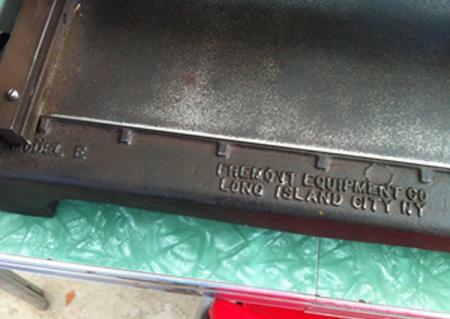 It’s a Fremont Press, made by Fremont Equipment Company of Long Island, NY. 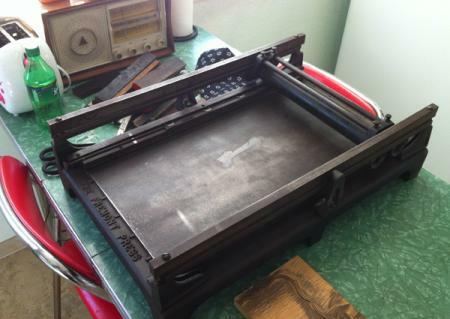 I think it’s a Model E.
I also have one of these proof presses. I got mine simply because it was The Fremont Press and I used to live in Fremont, CA (40+ years ago!). The bed is roughly 10” x 15” but the most curious parts are the top of the upper rails and the lower rails that the impression roller travels on are made of WOOD! This is not evident unless the black paint has worn enough and you then discover the wood. It is not adjustable and the form needs to be in a galley (or have a plate underneath it) to be the proper height to get an impression. 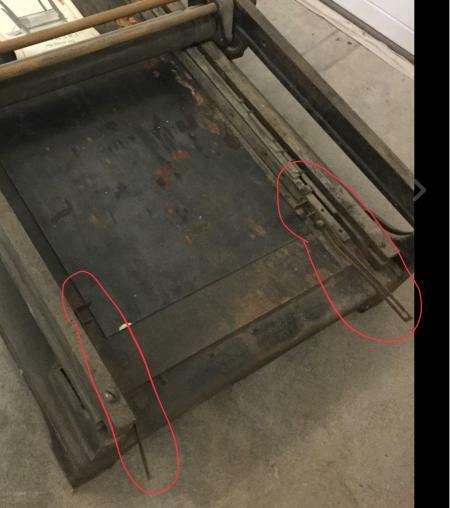 Not a great heavy-duty proof press, but sufficient enough to get a readable proof. The rubber on my impression roller is brittle and flaking off, so I don’t use it to print anything with. It is simply a curiosity in the shop and a reminder of my distant past. 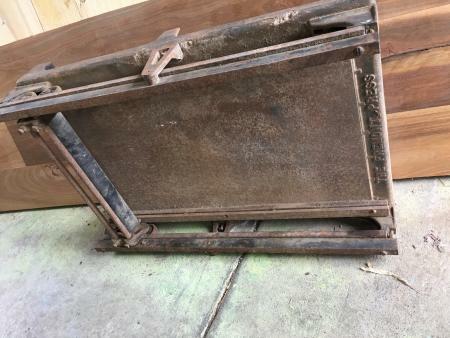 I have never run across an ad or any information on this press. into the “with all the words” search field, you’ll come up with about four snippet-view hits from 1929/1930 (American Printer, Printers’ Ink, Advertising and Selling, etc.) Since they’re snippet views, you won’t see much information - but it’s a start. A good university library would have most of these sources. Curiously, I can’t turn up a hit for The Inland Printer. There were no useful followups to this posting, though. I just got one of these yesterday. Yup! That’s it. It is great to know that it is vintage 1929/1930 or so. My guess that it did not survive long after that simply because it is not that great of a proof press other than for very light forms. It does not have the strength and rigidity to be able to apply enough pressure to a heavy form. Foolproof, mine is all metal, no wooden rails. I’m missing these metal strips.